Send your best wishes by delivering this Thrilling Sweet Gesture Gift Basket to the people close to you and make them surprised and happy. 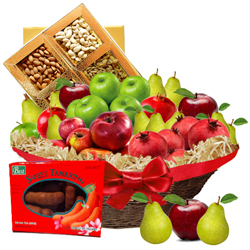 This deluxe Basket includes Cashew (250 gm. ), Raisins (250 gm. ), Almond (250 gm. ), Walnut (250 gm. ), Pistachio (250 gm. ), Pomegranate (1 kg. ), Pears (1/2 kg. ), Red Apple (1/2 kg. ), Green Apple (1/2 kg.) and Sweet Tamarind.